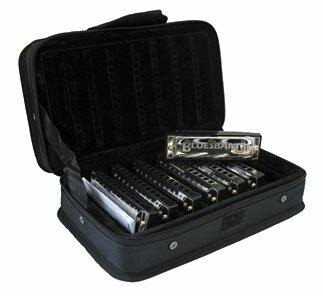 A complete set of blues harmonicas, the Blues Band 7 Key Harmonica set offers the seven most popular keys available today, A, Bb, C, D, E, F and G.
Bundled together in a comfortable black pro type hard shell case. Jam out to any song with this versatile harmonica package. A complete set of blues harmonicas, the Blues Band 7 Key Harmonica set offers the seven most popular keys available today, A, Bb, C, D, E, F and G. Bundled together in a comfortable black pro type hard shell case. Jam out to any song with this versatile harmonica package.